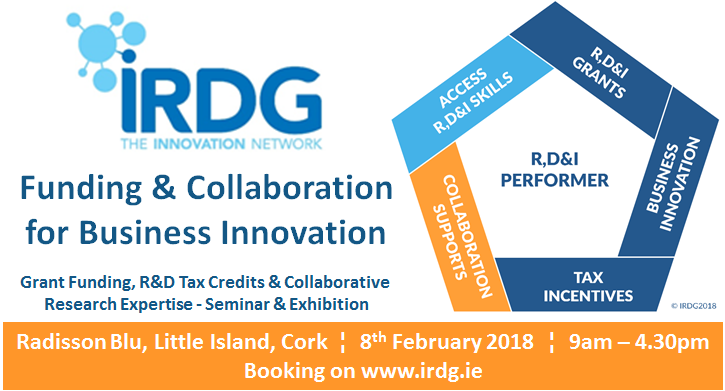 In this new format event on 8th February, we will bring you all the options when it comes to progressing your business innovation and market development with grant funding, tax incentives, accessible loans and research expertise from within Ireland and Europe. Supports including research capability, subject matter expertise, specialised equipment and finance are available to indigenous and multinational industries to help business innovation. The challenge for most businesses is being up to date with the variety available and evaluating options – be that around sourcing suitable partners, the funding and finance schemes, or the merits of collaborative activity versus in-house programmes. Part of IRDG’s service is working with members on a one-to-one basis to advise around this challenge. But we also create a unique forum which brings together all the key players supporting business innovation in the one room, to directly connect with and meet the industry audience. The 8th February in Cork is one such event. Carsten Morgenstern, Principal Banker, European Investment Bank will present on it’s 4 key pillars of investment – SME’s, Innovation, Environment and Infrastructure. In 2015, the EIB invested €755 million in the Irish economy. Traditional focus has been on large public and infrastructure projects but it now has an appetite to increase support for Irish businesses. John Madigan, Head of Products, Strategic Banking Corporation of Ireland – on accessible loans available through the Banks and SBCI directly for all sizes of company around Brexit, Market / Product Development, Working Capital etc. A large number of Exhibitors from across the Third Level Research sector will also be there to demonstrate their capabilities and discuss potential collaborative opportunities and funding programmes. 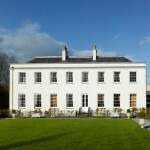 Accommodation rate offered for IRDG guests for the night of 7th February is €115 B&B (subject to availability). Please contact the hotel directly to book – 021 – 4297000. Please email Mary.Byrne@irdg.ie if you have any queries about booking.